IT’S A GENERALISATION to say things move more quickly in Asia, but certainly there are few cities in the world that have grown an international-class bar scene as quickly as Bangkok. Three years ago, there might have been only a handful of bars in Bangkok taking the art of cocktails and hospitality seriously. But a visit to Bangkok now is a serious endeavour. Don’t think you can do the circuit in a weekend – there are about 20 bars that could reasonably expect to be included in a guide such as this, and by the time you are reading this, a few more will have opened. It is moving that quickly. The mark of a bar culture’s development is often the advent of bartender-owned bars. It shows that the market has confidence in and respect for drinks and their makers. In Bangkok bartenders are not just forging drinks but serious careers too. This guide is not definitive, but it’s a good mix of places, from old to new, that shows the strength and diversity of the scene. We’ll start with one of the new breeds. With bladed, ceiling-mounted fans gently whirring to the easy, jazz-filled atmosphere, this is the colonially-themed bar that lives up to expectation. 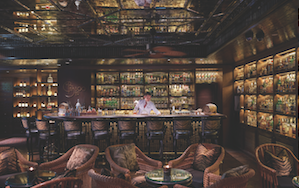 It is steeped in history, tropically clad, and serves outstanding locally inspired drinks – Bamboo Bar is what Raffles of Singapore should be like, without the monkey-nut shells. Bamboo Bar has been based in the Mandarin Oriental for 65 years but in 2014 was refurbished to glittering effect. The original rattan armchairs have been restored and tiger-print patterns top the bar stools, but dark marble and leather bring a contemporary edge, without meddling with the colonial outpost identity. Behind the bar is Khun Ball, who has retained a couple of house classics from three-decade barkeep Sompong Boonsri, but has also introduced contemporary drinks that draw on the Thai flowers, fruits, herbs and spices. The Magic of Thai Herbs (Tanqueray gin, bianco vermouth and flowers from Thailand’s Royal Project) is a good example of his elegant modern Thai bartending style.